RAIN, RAIN, HERE TO STAY? Levels of Kawainui Marsh, flooded by the recent heavy rain, approached the roadside of Kapaa Quarry Road yesterday. Rain is forecast for much of Hawaii tomorrow and possibly throughout the week, National Weather Service forecasters said yesterday. 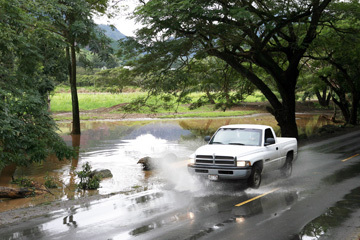 The state Department of Health issued a general health advisory Wednesday reminding state residents that they should avoid extended contact with ocean and stream waters after heavy rains because of the possibility of contamination from cesspools, surface runoff or sewage spills. To report a sewage spill on Oahu, call 523-4423. To ask about the safety of state waters, call the Health Department Clean Water Branch at 586-4309. Oahu faces a 60 percent chance of rain tomorrow, a mostly cloudy-with-showers Monday and the possibility of heavy rainfall Tuesday and Wednesday, the weather service's Honolulu office predicted last night. But the behavior of the Kona low dropping rain on the ocean west of the state yesterday is "very difficult to predict," said meteorologist Vladimir Ryshkow. "It's entirely possible that it will just rain from Sunday into next weekend" over all the islands as the low moves eastward, he said. The forecast comes after a wet weekend last week on the Windward side, with rainfall totals for some 24-hour-periods as high as 8 inches. Other than some road closures, a few houses with water in the yards and some minor landslides, there were no serious consequences to the deluge. "Whenever the soil is more saturated, there's inevitably more runoff of rainwater," Ryshkow said. "The possibility of soil slumping and of flooding is certainly higher." Honolulu sewer crews will be on the watch for more sewer overflows like two yesterday on the Windward side, city spokesman Mark Matsunaga said. "Whenever it rains on the Windward side, we have around-the-clock troubleshooters," he said. Heavy rain Thursday night led to raw sewage spills from manholes at two Windward locations yesterday, with some sewage reaching Kaelepulu Pond, which leads to Kailua Beach, and Kaneohe Bay, Matsunaga said. After the spills were stopped and streets disinfected, the affected waters were posted with warning signs and will be tested for contamination, he said. » About 2,780 gallons on Nahiku Street in Kaneohe, between 1:30 and 2:25 p.m.
» About 1,625 gallons at Hele Street and Keolu Drive in Kailua between 7:40 and 8:45 a.m.